One of our favourite Christmas traditions is the annual watching of Raymond Briggs The Snowman. The book is 40 years old this year, I have been watching the animation of it every year from childhood and now I continue to watch it with my parents and my own children. This Christmas, Barbour – glorious British outerwear brand and veritable institution of rural life, - have partnered again with The Snowman and created a campaign with a twist on the original story. I was inspired by this partnership to look outside to rural life this Christmas season and bring some of the outdoors indoors. Natural colours, such as greens, rusts and taupes, and wooden textures have been a huge trend recently, along with plants and botanicals, It’s been all about bringing the outside inside and making the home feel at one with nature. 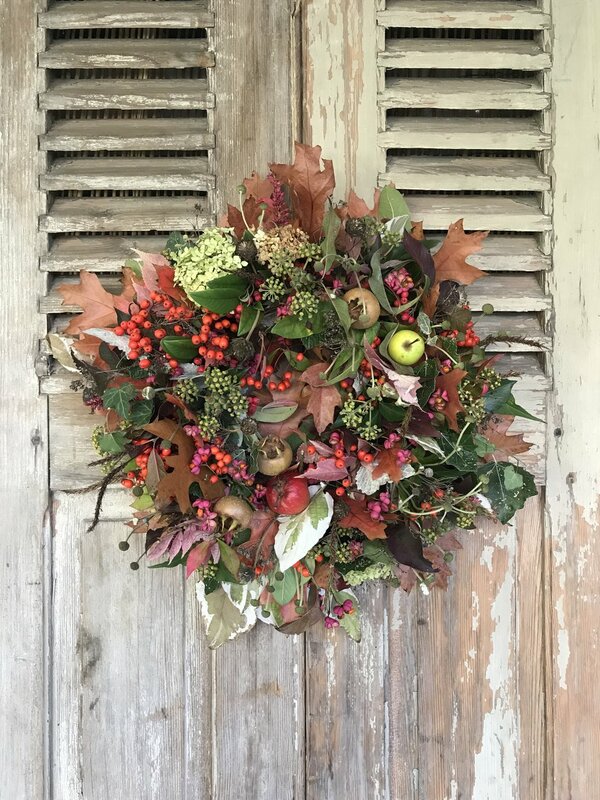 There’s nothing I like more than gathering ivy, logs, pine cones, berried branches and leafy twigs on a long walk in the countryside and then decorating my home with the foraged foliage. Another beauty of this trend of course is that most of it costs very little - or even nothing - as long as you know where to look - and remember take a set of secateurs with you! Foraged wreath by The Wildgirls. Another popular trend that is also in keeping with the ‘outside inside’ theme is the move towards using flowers all year round. Florals have been big news in fashion in recent years and this, together with the improved quality of faux and dried flowers, has meant that flowers are not just a summer theme any more. Bedecking a Christmas tree with faux flowers and using floral embellishments for wrapping is a growing trend and a refreshing change from baubles and tinsel. Tartan, of course, is a Christmas trend that will never go out of fashion. It’s timeless and traditional and also lends itself well to the ‘outside inside’ theme. Foliage, berries and greenery always look very handsome and majestic when styled with tartan. Use tartan as bows in your tree, ribbon for your wrapped Christmas gifts or as a tablecloth for your Christmas dinner table. Whichever theme or trend you decide on for styling your Christmas, it’s always more fun to create it with family and friends and make it part of your family tradition, just like watching The Snowman with your family every year. This is blog post is part of a paid partnership with Barbour. As always, all views are my own. Newer PostChristmas Decorating with Sainsbury's Home.